No matter the size of your balcony, there is always room for creativity and design. It may take a bit of manoeuvring around, but with the right plan in mind, you can transform your small balcony into your favourite hangout spot. Having a balcony of any size is a huge perk for any living space. It allows you to bring your living room outdoors in the summer, and to enjoy the fresh air. Sit outside and watch the sunrise or sunset, all while still enjoying the comfort of your home. Whether you are renting an apartment or own your home, there are many budget-friendly designs that you can do with your balcony. Take a look at some of our ideas to get your balcony hangout ready. Although this will be more for homeowners rather than rents, changing the railing along the balcony can make a huge difference. You can go for a classic look that won’t take away from the rest of the design on the balcony, or you can go with an elaborate, custom-made railing that is the attraction piece in your design. Browse through some of our recent railings to see how they can dramatically change the feel of your balcony. You want your balcony to be an extension of your home. To achieve that look, keep the design scheme you have inside when planning out your balcony. Stay within the same colours and theme to keep your transition from inside to outside smooth. One thing you’ll notice right away with a small balcony is the lack of space to place items. This will force you to be creative with your design. Don’t forget about the wall space. The walls around your balcony are like a blank canvas. Hand plants and lights off of them, or other decorations that add to your theme. An easy way to change your balcony of any size is to lay down an outdoor rug. Balconies don’t always have the most beautiful flooring unless you can afford to upgrade it. Instead, take a look at different rugs available. You can start with the rug and use the colour scheme as inspiration for the rest of the balcony. You’ll want outdoor lights on your balcony if you hope to spend much time there at night. However, you don’t want to give up precious space for a lamp. Opt for string lights instead. You can hang them around the railings, the walls of the balcony, or even across for a unique feel if there’s room. One thing every balcony needs is a place to sit. But a couch and table can take up much space and leave you with little to no room left. Luckily, there is outdoor furniture that has two purposes – storage and seating. When you’re decorating a small space, be creative with multi-purpose items. They can serve you in two different ways without taking up additional space. So, our outdoor couch could hold items under the cushion, and the table can turn into an additional chair by adding a cushion on top. Have fun when decorating your balcony. From installing unique and custom built railings to draping string lights all around, every change will enhance the feel of your balcony. Make it the place everyone will want to hang out on when the sun comes out. More and more you’ll find glass railings in homes. Whether it be inside following the stairs or outside around the deck or balcony, glass railings offer safety that is aesthetically pleasing. You can see through the glass as to not obstruct the view of your surroundings. It allows you to watch your children play on the lawn as you relax on the deck above. What makes glass railings very appealing to homeowners is how durable they are and the minimal amount of upkeep required to keep them looking new. Of course, over time they will get dirty, especially if they are outside railings. However, with a regular cleaning routine that includes the glass railings around the home, you’ll keep them looking in pristine condition for many years to come. To help you out, here are a few tips to easily keep your glass railings clean. Water spots and streaks are probably one of the most frustrating parts of keeping the glass clean. You may notice water spots on outdoor railings after it rains or splashed with water. For indoor railings, likely you would notice streaks after wiping the glass down. Either way, they are annoying and can make the glass look dirty. To avoid water spots and streaks, wash the glass products specifically meant for glass, or mix equal parts of vinegar and water in a spray bottle. Wipe down with a clean cloth that will absorb the water. Dust and dirt will make its way onto the glass of the railings. Unfortunately, it is inevitable. Inside your home, dust floats around and grasps on to things around the area. Outside, dirt will stick to the glass when it storms or is windy. Luckily for you, dust and dirt are some of the easiest things to clean from glass. A soft, dry cloth will easily wipe off the dust and dirt, revealing crisp, clear glass. Depending on where the railings are, you may have to deal with grime build up from time to time (or quite often). Lots of times you see grime build up on the glass doors of the shower. The same thing can happen to your railings, especially if they’re in the kitchen and continuously get splashed with liquid. Your best bet is to try and wipe down the glass as soon as a spill happens. However, if that is not always possible, the water and vinegar solution will work just fine to clean them up. Use a damp cloth to wipe the glass. You can also use glass cleaning products as well. For outdoor railings, there is a good chance you’ll encounter animal droppings on the glass. Most commonly are bird droppings. Cleaning up animal feces from glass is quite easy, but you should take safety precautions to do so. Wear disposable gloves and use a cloth that can be thrown away after. Using the vinegar and water solution will not only clean the glass, but it will also disinfect it as well. Cleaning the glass on railings typically is not a difficult task. By staying on top of it, though, you can keep the glass looking like brand new for decades to come. Don’t let a common household necessity blend into the background. The stairs can be a striking feature in your home if appropriately designed. From walking up a few steps to enter the home, or taking a grand staircase up to the next level, every stair can be a unique addition to a house. One way of incorporating a stunning staircase is with floating stairs. A floating staircase adds a distinctively modern touch to any home it is in. What makes them so appealing is that they are a perfect combination of functionality while being stylish. If a floating staircase sounds appealing to you, let’s take a look at the ins and outs to see what makes a floating staircase unique. Floating stairs, although look like it, are not actually floating. They still have structural support to make them stand up. You’ll be walking up and down these stairs, so you want to ensure they can still maintain their structural integrity. When designed and installed correctly, these staircases give off the illusion that they are floating. Even though there will still be certain areas of support and attachments, where and how they are built will keep them hidden away. One major perk of floating stairs is the additional space you save underneath of them. Traditional staircases can take up a large amount of space because they require a solid structure to support them. Because floating staircases are designed without the solid structural support, it opens up space underneath for you to do whatever you please. There are many creative designs for under the stairs. You can turn the space into a cozy reading nook, a fancy storage area, a small home office, even a dog house for your furry friend. Basically, anything that you lack in your home you can use the space under the stairs for that. With floating stairs, the design options are only limited to what you are house allows you to build (or your wallet allows you to afford). Although they tend to be on the pricier end of staircases, there are so many ways you can build and install them in your home. You can go more minimalistic and have as little of accessories to them as possible – only the steps jutting out from the wall are what you see. You can have them follow along with the wall and curve up to the second floor. You could even suspend the steps from the ceiling, making them look like they are really floating. In the end, floating staircases are a preference rather than a necessity. However, they do offer a unique look to any home they are installed in. Take your home to a modern level by installing floating staircases. You may hear the terms cast iron and wrought iron thrown around a lot when you’re looking at custom welding work. You may think that the two terms are interchangeable, but they re actually quite different. There are numerous differences between cast and wrought iron, but the main difference is how the product is prepared. We’ve broken down all of the differences for you, so you can be better informed in case there comes a time when you need some welding work done! Cast iron is pretty much exactly what it sounds like- something made from a cast, or mold. This process begins with iron being melted down, and then poured into a specific mold, depending on what is being made. Cast iron isn’t actually really iron. It is made up of iron alloys, or often gray iron. There are typically traces of other elements, like carbon, manganese, and phosphorus as well. e addition of multiple elements with different melting and solidifying temperatures means that the product is solidified while its components are in different phases, creating tension points within the cast. If enough pressure is added, the piece will fracture rather than bend. However, you would have to add a significant amount of pressure to achieve this. oured into a mold, the actual metal is “wrought” or worked on to create the desired shape. 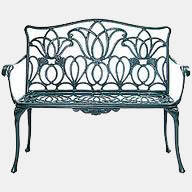 Unlike cast iron, wrought iron is composed of primarily iron, with about one or two percent of impurities like phosphorous, sulfur, or aluminum oxides. 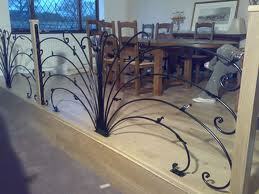 Although it is still extremely strong, wrought iron is much more malleable than cast iron. This means that the iron used for one project can be reheated and used over and over again to adapt to your needs. Actually, the more a piece of wrought iron is reheated and worked on, the stronger it becomes. Since wrought iron is more malleable, and less heterogeneous than cast iron, it lasts longer in most cases. A piece of wrought iron would have to be exposed to a serious amount of pressure, or extremely high temperatures in order to break or become damaged. Although both cast and wrought iron have their advantages, they’re not often used in present day. They are typically only worked with by artisans or extremely skilled welders. Both are great for making unique, beautiful pieces! Your pool is the spotlight of your backyard. Many family gatherings, neighborhood parties, and other special events happen around your pool. While having a pool has many physical, mental, and social benefits, safety is always a concern. Even if you and everyone else in the household know how to swim, some of your guests may not. It can also be dangerous for pets to be left unattended around a pool. You can’t keep an eye on your backyard all the time, so the most practical option for safety is to install a fence around the pool. Luckily for you, there are so many stylish designs to choose from, including glass railings and fences. Glass railings are safe, modern, and practical. With so many advantages, like safety, style, durability, and visibility, you’ll see why glass fencing is the way to go! You may think that glass fences would be difficult to keep clean, but it is actually easier than you think! The glass will never stain, unlike other traditional fences. All you need to keep your glass fence looking brand new is some glass cleaner and a rag. Any dirt, or spilled liquid, can easily be hosed off, or wiped off, of the glass. Unlike other fencing options, like wood or metal, your glass fence will never obtain water damage, and it will never rust. Since they are resistant to any form of decay, glass fences are extremely durable. When you install glass fencing in your backyard, you won’t have to worry about redecorating, or buying new patio furniture. Glass matches with everything, and is the ultimate compliment to any setting. Although the glass is very subtle, it adds an elegant, modern touch to your backyard. Also, the transparency of glass will make your pool area appear larger, as opposed to the closed-off feeling of traditional fences. Glass fences are a super practical option for pool fencing because they’re clear! You will be able to see through the fence and keep an eye on any guests that are swimming, or any children playing in the backyard. Glass fences are also typically taller than traditional fencing, making it difficult for children to enter the pool area without assistance from an adult. Plus, the visibility provided by the glass fence allows you to enjoy an interrupted view of your pool, and the rest of your backyard. Glass fences are creative, practical, and durable. When it comes time to install a fence around your pool, Pro Weld will help you design a custom glass fence. Things you will want to consider are the height you would like the fence to be, what type of gate you would like installed for the entrance (self-closing, auto-lock, etc. ), the type of glass you prefer, and how/when you would like your new fence installed. Perhaps it’s not something that comes up right away when you think about ways to enhance the value of your home but maybe it should. We’re talking about installing metal railings at various locations around the property. Metal handrails – whether steel, aluminum or wrought iron – go a long way toward enhancing the aesthetics of your home both inside and out and also play an important role in making your home safer for everyone. Below we’re going to look at just some or the reasons that installing metal rails, balustrades, banisters and fencing in and around the home is an idea whose time has come in 2018. 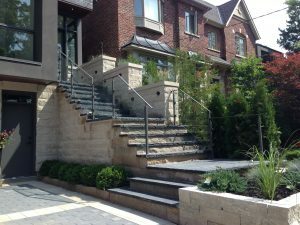 Metal handrails whether on the main staircase or around the deck make a lot of sense from both aesthetic and practical perspectives. Below we’ll look at a few of the reasons you should consider metal handrails for your home. Safety – One of the biggest reasons to consider metal over wood or vinyl is safety. When properly installed metal handrails will be able to absorb a heavier load than wood, vinyl or glass, which is important if there are kids in the house or even if you entertain a lot. If your child or guest accidently falls against a wooden banister it may or may not be able to stop them from crashing through. With wrought iron or steel everyone will emerge safe and sound. Beauty – Metal has been used in and around the home for centuries. Wrought iron fences built 200 years ago can still be seen in some of the older neighbourhoods of North America. They’ve never been replaced because they have a timeless appeal that is just as strong today as it was when they were installed and that is not going to change any time soon. So if you want to enhance the curb appeal of your home, consider metal fencing or handrails. Low maintenance durability – Metal, regardless of what kind, is not going to attract termites or other pests and you won’t have to take any extraordinary steps to protect it from the elements, even if it’s outside. In fact there’s a good chance your metal handrails will outlast the house itself and will be used by some enterprising builder in the future to adorn their new abode. All you really need to do is keep them clean and keep an eye out for corrosion (if they’re outdoors). Metal railings are one of the most cost-effective enhancements you can make to your home this year. But they’re more than just a bottom line investment. They’re also an investment in the safety of your family and friends, the overall look and experience of the home (including the property around the house) and they never need any sort of special attention to maintain their timeless good looks and practical effectiveness. Talk to the experts at Pro Weld about new metal handrails for your home. Without welding much of the modern world would simply fall apart or never come together in the first place. Welding is essential to a vast array of industries that would undoubtedly fold without it. That includes ship building, bicycle manufacturing, skyscraper construction and auto manufacturing. Even appliances, exercise equipment and satellites count on welding to hold them together. But when are you likely to actually require the aid of a mobile welder? Construction companies – Heavy equipment like earth movers, backhoes and front end loaders are often pushed to the max and sometimes beyond. It’s not unusual for them to crack under the strain and require a fast, onsite fix. When the alternative is to shut down the job site being able to enlist the services of a mobile welder to get things back up and running fast is the smart, cost effective call. Marinas and boat owners – In the aftermath of intense storms marinas often find themselves facing damage to their docks, trailers, fencing and more. Because it’s not practical (and in some cases not possible) to bring these items to a welding shop, the welding shop must go to the marina. Without effective on-site welding services to call on many marinas would be in a very tough spot following heavy weather events. Homeowners – Accidents happen and sometimes the wrought iron gate will be damaged by contact with the car or the railing on the deck will be damaged by a falling branch during a heavy weather event. If you didn’t have a mobile welder to call upon you’d have to take the damaged fence or railing apart and lug it over to the welding shop and then have someone re-install it afterward. Vacationers – Yes, believe it or not even the family on vacation may at some point need the services of a mobile welder in order to keep their adventure on track. All it takes is one unfortunate encounter with a road hazard to cause damage to the trailer hauling the boat or other family possessions. Without the aid of a mobile welder they could be stranded and their holiday brought to a screeching halt. Mobile welders are busy people these days answering the call of everyone from families on holiday to road crews to boat owners and more. The next time something breaks in your home or factory, on your construction site or in your marina don’t despair. Call the expert mobile welding crew at Pro Weld. We’ll have you back to work or back on the water or road in no time flat. Mobile welding as an industry has been growing by leaps and bounds as construction companies, marinas, homeowners, property managers and more have discovered how much easier life is when the welding company comes to them. But as the demand for mobile welding has grown so has the number of people with very little if any welding experience trying to cash in. As a result some customers have been left with a very unpleasant taste in their mouth and that’s not good for them or for the industry as a whole. So in the interest of weeding out the frauds for everyone’s benefit here are 4 tips that will help you find mobile welding in Toronto you can count on. Ask how long they’ve been in business – While every company has to start somewhere you don’t want to be someone’s first customer; or even close to their first. That’s just asking for trouble. You’d like your mobile welder to have at least a year or two experience with mobile welding and quite a bit of experience with more traditional forms of welding. Ask for references – Do this up front. If the prospective welder balks you can be pretty sure they weren’t worth doing business with. Keep in mind though that most of the work mobile welders do is of the emergency variety which doesn’t always lend itself to obtaining references. But ask anyway. Even a couple of numbers is better than nothing. Once you have the numbers follow up with them. Ask some technical questions – Ask them if they’ve ever done a hot start on a SMAW power source (most experienced welders have). Or ask them if they have TIG or MIG certificates (you want someone that does). Someone that’s trying to get over on you may feign indignation at your questions, while someone who knows what they’re doing will probably be amused that you’re trying to trip them up and answer your questions in a light hearted manner. Ask for proof of insurance – Welding is dangerous. You don’t want someone welding on your property unless you’re certain they have adequate insurance coverage. That means workman’s comp for the welding company employee and liability coverage for the welding company in case something goes wrong or someone gets injured. If the welding company cannot produce evidence of adequate insurance coverage you’ll definitely want to take a pass. Don’t get fooled into hiring someone who may or may not be qualified or may or may not be insured. Go right to the top right from the start by hiring the experts at Pro Weld. We do mobile welding in Toronto right.